For awhile, it didn't look like we were going to make it. We started late in the season across the Pacific, we stayed a long time enjoying the Marquesas, and we were sucked into The Aquarium with a fascination and pleasure that made it really hard to leave the Tuamotus. Yet ultimately the siren call of other kid boats, free drinks, and dancing girls lured us to Tahiti just in time for the annual Tahiti-Moorea Rendezvous. The rendezvous is sponsored by a group of organizations from Tahiti, New Zealand, and the United States. 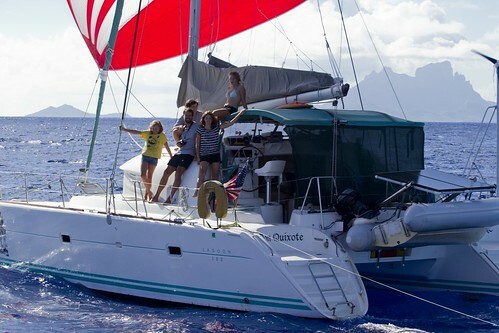 The purpose according to Andy Turpin of Latitude 38 is to welcome cruisers to French Polynesia, celebrate our successful crossing, and introduce cruisers to Polynesian culture. Our mission as guests according to the Tahitian tourism folks is to learn all we can and then to go out and encourage other cruisers and tourists to visit the islands. The Kiwis participate because we yachties have to go somewhere when the weather gets ugly, and New Zealand marinas and chandleries would just as soon we turned south instead of continuing west and on to Australia. They told me that there are on average just over 600 cruising yachts making the trek each year not including the mega yachts. This represents a very large chunk of commerce to French Polynesia and no trivial amount to downwind destinations. Figure each non-mega yachts drops at least $2K during a three month transit, and you begin to have some idea why all these varied organizations go to so much trouble. The effort put into the event was evident this year in the outstanding party enjoyed by all in Moorea. The rendezvous is actually a three day event starting with welcomes, speeches, captains meetings, dancing, music, and cocktails in Papeete. The second day is a rally (not a race!) from Papeete to Moorea. However, when you put two boats in the water anywhere near each other, it's a race. After the non-race, folks gather on the beach for more speeches, cocktails, music and local dancers. The third day, however, is really the centerpiece of the rendezvous. The day includes canoe races, stone lifting, coconut shucking and shredding, fruit tossing/carrying, lei and palm leave crafts, more cocktails, more Tahitian dancers, more island music, more speeches. We had a fantastic time. All of us had a FANTASTIC time. I'm so tired I can hardly lift my arms to the keyboard, but it was worth every erg of energy. The kids ran like wild animals all over the beach. We had at least 16 kids, probably more but they didn't sit still in one place long enough to get a count. I admit to my usual horrible parenting in that I lost track of all three of my children within about 5 minutes of landing on shore. In fact, I believe it's accurate to say that I checked the dinghy far more frequently than I checked to see whether or not my kids were alive and well. Somehow, they survived parental neglect, however, and are all back on Don Quixote demanding pasta. Tomorrow, we are hosting a bit of a kid boat party on the beach. The other boats were asking me today what I had planned. These are boat kids. I have nothing planned. The sum total of my plan is to show up with a medical kit, cooked seasoned meat in tubes, bread and condiments. And a book.